Come over Newport Bridge and stay straight (do not get off at scenic Newport). Follow to end and turn LEFT at the traffic light. Follow to very top of hill and go straight. (Sunoco Gas Station will be on your RIGHT). Now go straight through first stop sign and to bottom of hill and bear LEFT at next stop sign. This is now Green End Avenue. Follow through 2 traffic lights and then to the first stop sign and turn LEFT onto Third Beach Road. Go one block to "T" and turn RIGHT onto Wapping Road. Come over bridge and follow RTE 24 to EXIT 1 RTE 138 / NEWPORT BEACHES. Bear RIGHT off ramp and follow to first traffic light and turn RIGHT onto RTE 138. Follow straight a few miles and Turn LEFT at the traffic light just after the Polo Fields onto Sandy Point Road. 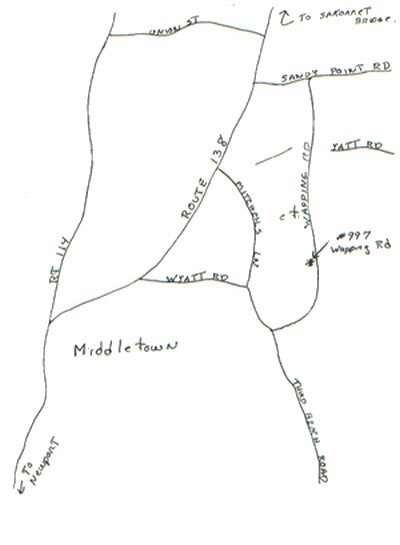 Make your first RIGHT onto Wapping Road - Rocky Brook Orchard is 1.7 Miles on your RIGHT - # 997. Come over bridge and make way to RTE 138 - Follow directions from Sakonnet Bridge.